Have you ever found that if you sleep in, you feel heavy and sluggish all day? Or that at about 10 pm you get the munchies? Do you sometimes wake up at 4 am worrying, and have a hard time falling back asleep? Ayurveda has a fairly simple explanation for all this: There is a natural ebb and flow within the natural world, including within your own body and mind. Vata, Pitta and Kapha are energetic forces that govern the tides of your life, and if you understand these forces, you can tune into the natural rhythms of the world, and make informed choices to help steer your life into healthful, harmonious directions. The doshas exert their influence upon us in four hour increments throughout the 24 hour day. Each four hour time period is dominated by one dosha, and thus influenced by the qualities of that dosha. In other words, there’s a vata, pitta and kapha time of day and a vata, pitta and kapha time of night. Understanding this allows you to choose activities, food choices, etc. that will support the dominant energy inside and around you at that time. Let’s begin with the KAPHA TIME of day, because time periods always begin with kapha dosha. Ayurveda teaches that it’s best to get up in the morning before 6:00 am. This is because at 6:00 am, kapha becomes dominant. Kapha is the energy of water and earth, and thus is heavy and sluggish. If you awaken during kapha time, which is between 6:00 am and 10:00 am, these qualities will increase within you - and you get that “I overslept and am having a hard time waking up” feeling. It’s best to get up before 6:00 am, and engage in some early morning activity to get your heart pumping and your day off to an energetic start. Eat a light breakfast that is well spiced. Despite prevailing wisdom, breakfast is NOT the time for a big meal, as this will only increase heaviness and sluggishness. Lunch is actually the most important meal of the day, when the warmth of the natural world supports digestive fire. 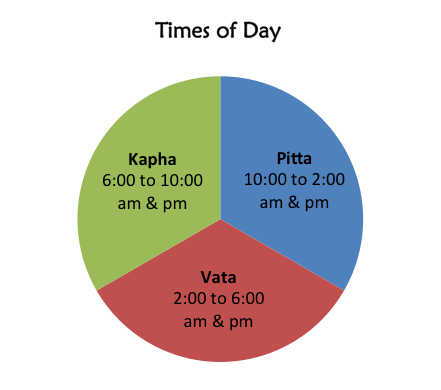 Kapha time flows into PITTA TIME, which begins at 10:00 am and continues until 2:00 pm. Pitta governs the time of productivity, the time that the sun is highest in the sky, and there is more heat in the natural world. Pitta is the dosha of heat, as it is made of fire and water. During this time of day, heat will naturally predominate in our bodies and minds. By harnessing this midday heat, we are propelled to be productive and accomplish our goals. However, it’s best to avoid spending time in the direct sun at this time of day, especially engaging in vigorous activity in the sunshine if you are predominantly pitta, since those with a pitta nature are likely to experience an increase of heat symptoms within the body at this time, including burning indigestion, skin rashes, or even flares of temper. And as mentioned above, lunch is when you can most indulge in a big meal, as you are best able to digest it at this time, since digestion is a fiery process and will be supported by the heat in the natural world. The pitta time of day fades as the VATA TIME of day begins, at about 2:00 pm. Vata time continues until 6:00 pm as the day gives way to night. Vata, which is made of the elements air and space (ether), governs the time of transition. The naturally light, etheric qualities of this time of day allows creativity and expansive thinking to peak, making it a great time to engage in creative pursuits and problem solving. However, it can also be a time when those of a vata nature may feel agitation, so choose a calm environment in which you can work while minimizing excess sensory input such as bright lights and loud noises. Instead, ground yourself in a peaceful environment, and grab a cup of herbal tea and a warm blanket. Vata is the most delicate of the doshas, and the most likely to become imbalanced, as it is the dosha of movement. By keeping it pacified at this time of day, it’s creative gifts can manifest and imbalances avoided. As the cycle continues, and we move towards night, times ruled by the doshas repeat. KAPHA becomes dominant again from 6:00 pm to 10:00 pm, when the water and earth elements accumulate once again. These heavy qualities tell you it’s time to wind down, eat a light, early dinner (don’t overeat at dinner - avoid heavy food), and settle in for the night. As you move towards 10:00 pm, begin your soothing preparations for sleep. By going to bed during the kapha time of day, the heavy quality of this time of day will help ensure that you drift off to sleep easily, naturally. During the last hour or two before bed (from about 8:00 pm to 10:00 pm), engage only in calming activities that nourish and soothe you. No agitation, no distressing conversations, no violent tv shows - or this can interfere with sleep! Instead, take a warm bath, sip tea by the fire, listen to soothing music, enjoy light conversation with loved ones. Allow the natural kapha time of day ease you to sleep. As 10:00 pm rolls around, hopefully you are snug in bed, sound asleep. This is important, because PITTA rules activity, and during your sleep is no exception. The pitta time of night is from 10:00 pm to 2:00 am, and it is important to be sleeping during this time, because the activity that now takes place is inside you; this is the time of internal cleansing. If you remain awake during this important time, you miss out on the benefit of this cleansing time of day. In fact, if you are still awake, you may find that the munchies kick in, and you find yourself at the refrigerator, reaching for ice cream or leftover pizza, since the digestive force will go looking for something to digest. Your body will thank you for skipping this, and being asleep instead! VATA time returns from 2:00 am to 6:00 am, marking another time of transition. However, the early morning vata time is not a time of creativity, but rather of receptivity. Yogis discovered long ago that this time of day, when air and ether dominate, is the best time of day for meditation, prayer, chanting and other spiritual practices. By arising prior to 6:00 am, you are able to maximize this experience, spending this peaceful time of day in spiritual pursuits. If you are still in bed, you may find that your sleep is light and disturbed, or that you awaken and have a hard time shutting off your mind. Meditation at this time can be a challenge for some, especially if you have a lot of vata in your nature or have a vata imbalance. Utilizing mantra or affirmations can be very helpful for quieting the mind, have a cup of warm milk in the evening before bed with a pinch of freshly grated nutmeg in it, engage in gentle yoga, or inhale some soothing essential oils such as lavender or jatamansi to calm the mind. By listening to the cues of nature, and following her rhythms, she will reward you with optimal health, balance, and peace of mind.